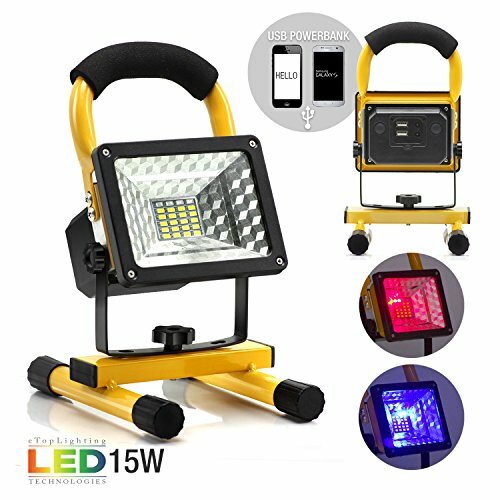 eTopLighting 15W Portable LED Flood Work Light is an efficient flood light that is adjustable and easy to use. 24 crisp LED light chips illuminate your workspace with an even bright output. 360 degree rotation is perfect for easily switching the orientation of the light. 90 degree tilt angle makes it easy to aim light in hard to reach angles. Rechargeable battery and built in power bank provide enough power and juice for any application. Red and blue emergency flashers come in handy during roadside emergencies, or during other urgent situations. 15W LED Flood Work Light with 24 Bright LEDs that provide a crisp bright output. Rechargeable battery enables you to ditch one-time-use batteries for good! Built-in power bank is capable of delivering a quick juice to your phone or other devices when needed. Emergency flashers (red and blue) come in handy for roadside assistance, or other emergency needs. 360 degree horizontal rotation and 90 degree vertical tilt for maximum flexibility. If you have any questions about this product by eTopLighting, contact us by completing and submitting the form below. If you are looking for a specif part number, please include it with your message.